As they have done since September 9, 2007, every Saturday morning, from 7:00 AM to 8:30 AM, men gather in the St. Jerome hall to hit the “pause button” on life. As one week ends and another begins, led by our pastor, we meet for a brief 90 minutes to share their stories and to give and receive perspective, insights, and guidance for becoming better husbands, fathers, grandfathers, sons, workers, and members of the community. Every sixth week the men hold a structured prayer session in the church sanctuary followed by a discussion of the prayer in the church hall. Examples of Men’s Ministry readings and questions are below. The bottom of this page offers several reflections the men have had about the inherent spirituality in their everyday life experiences. During Lent 2009 a number of the men contributed prayers they say often – some composed by themselves, some from books, cards, or the Internet – to a Men’s Ministry Prayer Book. The need for prayer, the power of prayer, and how they are doing with praying comes up frequently at Men’s Ministry meetings, especially during Lent. 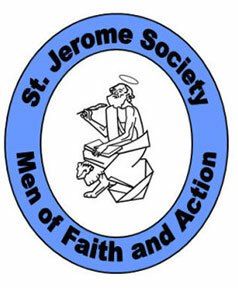 The St. Jerome Society, Men of Faith and Action, is designed to help parish men of all ages realize what it means to be a Catholic man today. The group’s primary mission is to help men enrich their relationships with Jesus Christ and apply their faith to their daily lives. The men work to achieve these goals by joining in small groups to discuss their successes and struggles, praying together, studying the Sacred Scripture, and holding each other accountable to their Christian values by the way they live their lives. Through this fellowship, they learn that they are capable of realizing and committing to their true priorities, and living that commitment. In fostering this, the St. Jerome Society, Men of Faith and Action, strives to bring its members closer to God, their families, the community, and each other. If you would like to meet other men facing the challenges of being Catholic in today’s world, we invite you to join us and see what we’re all about. If you would like more information, please get in touch with one of the Contacts listed below. Every Saturday and on other special mornings, we gather in the Parish Hall or Sanctuary from 7:00 a.m. until 8:30 a.m. to reflect on our spiritual lives. Our vision is to share our personal stories, struggles, faith journeys and God moments. We intend to see through the lens of scripture and we pray. We value an atmosphere in which honest, safe and respectful expression is shared without divisive partisan political commentary or demonstration, either subtle or overt. We are committed to creating a safe place for community, love, sharing and faith exploration in an atmosphere of God’s Grace. For the first three years of the Men’s Ministry six-week discussion cycles revolved around a particular theme, such as “Attitude Adjustment: Down but Not Out” or “Men At Work: Performance Anxiety.” A typical meeting begins with a Scripture that is e-mailed to the membership on Thursdays, such as Mathew 20:1-16, the Workers in the Vineyard, for a discussion titled, “Who Is the Boss?” At Saturday’s meeting the group tackles three questions inspired by the reading, in this case: 1. What role does work play in your life? Is it in balance? 2. In your dealings with God are you a bargainer or a truster? 3. What changes would you like to make in the work part of your life? From mid-2010 until mid-August 2012 the format changed to using the next day’s Sunday Gospel, sometimes the First or Second Reading, and occasionally personally-chosen Scripture passages, as the jumping-off point for questions related to “The Challenge of the Sacred in Everyday Life.” In late summer 2012 a five-man rotation began writing the discussion questions based on the Sunday Gospel, or on selected Scripture passages, or on prayers or meditative writings that each of the five men personally chose in turn. Every sixth Saturday the men hold a prayer service in the church sanctuary, followed by a discussion of the prayer service in the church hall. Click here to see sample readings and discussion questions for 2010. Click here for examples of those reflections. From time to time the men of the Men’s Ministry share their reflections in writing. These honest and revelatory reflections often revolve around the inherent spirituality in everyday life experiences. In 2009 and 2010, as an effort to sacrifice during Lent and improve their health, the men of the Men’s Ministry started an eight-week Lenten Losers program. All in the parish were invited to reach weight loss goals during Lent and/or to sponsor a particular Lenten Loser with a pledge of $1.00 (or more!) a pound to be used to provide meals to the needy, particularly groups like Malta House (a shelter for young, unwed mothers) and Home for The Brave (a veterans half-way house in Bridgeport). In the program’s first year $505 was donated to each.